Scarce Bellin map of the southwest coast of Africa and the Cape of Good Hope. Carte Reduite d'Une partie des Costes Occidentales et Meridionales de L'Afrique Depuis Cabo Frio ou Cap Froid. 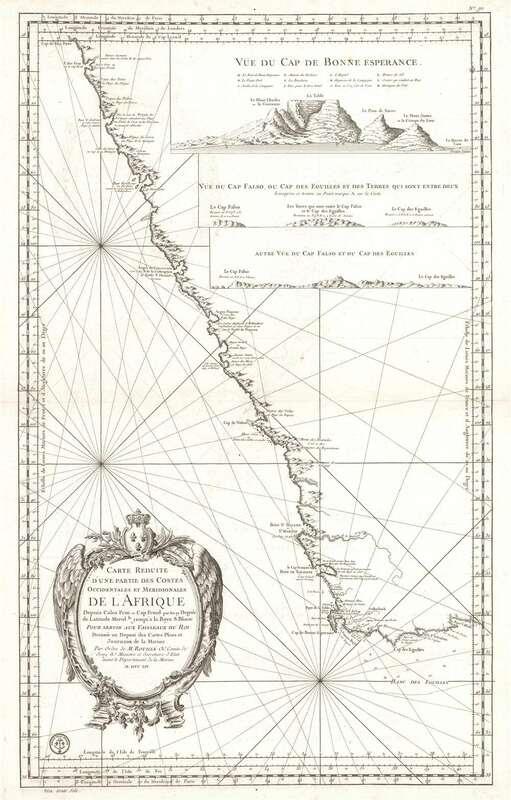 This is a scarce and attractive 1754 nautical chart by Nicolas Bellin depicting the southwest coast of Africa from Cape Fria in Namibia to Cape Agulhas (Cape of the Needles) and the Bay of St. Blaise, including the Cape of Good Hope. It shows incredible detail along the coast with capes, bays and topographical features including mountains, rivers as well as coastal features noted. Elevation is beautifully rendered in profile. The map includes three profile views in the top right quadrant. These are ‘Vue Du Cap de Bonne Esperance’ (Cape of Good Hope), ‘Vue Du Cap Falso, Du Cap Des Eguilles et des Terres Qui sont Entre deux’ and ‘Autre Vue Du Cap Falso et Du Cap Des Eguilles’. Cape Town, Constance (Constantia), Stellenbosch and Hangklip are accurately identified. This map was created by Bellin, who was at the time attached to the Depot de la Marine. Bellin was commissioned by King Louis XIV to augment and correct the work earlier started by the Academie des Sciences. Eventually five variations to this map were created. Bellin’s name is removed from this particular chart. An elaborate and beautiful title cartouche adorned with the arms of the Depot de la Marine is included. Published by the Depot des Cartes et Plans de la Marine. Very good. Minor wear along original centerfold. Some offsetting. Minor foxing. Original platemark visible. Norwich, O. I., Norwich's Maps of Africa: An Illustrated and Annotated Cartobibliography, #279.